Whether you slid into a spot like butter to pass your driving test or you’d rather not recall that particular day, when you’re headed to Heathrow the last thing you want to think about is what might happen to your car. That’s where Purple Parking comes in—your one stop shop for a perfect parking experience, when you park Purple, you park perfectly, every single time. So grab your Purple Parking promo code to ensure you’re getting the best price! In 1990, Heathrow International Airport was expanding and traffic in the area was increasing dramatically, bringing with it additional headaches for tourists and travellers alike. With a keen eye for business and a focus on transportation economies, the young and entrepreneurial Michael Inwards partnered with Ken Rayne to establish a small business by the name of Secure Storage on Rent Road in Southall to allow customers to park on the perimeter of the airport and travel in style in comfort via a shuttle bus straight to the terminal. As the business grew in popularity over the next five years, Inwards and Rayne expanded, acquiring more buses, bringing on new staff and building a loyal customer base of business travellers. As the demand shifted and grew, Secure Storage became Purple Parking, and the Purple Parking management realized that for the business traveller a chauffeur service would be even more desirable than a shuttle bus, and the Meet and Greet Service was born. By 2002, Purple Parking was providing parking, shuttle and chauffeur service for travellers locally at Heathrow and nationwide, always striving to update and improve the services provided to meet the changing needs of today’s travellers. Today, Purple Parking employs 650 staff members nationwide and offers specialty services such as car washes alongside everyday low prices, tight security, and friendly attentive service. Providing parking services for more than a hundred thousand customers worldwide with the Park and Ride services, and more than one hundred thousand more though the chauffeur service, Purple Parking is an English institution. The first step towards a spectacular trip is booking the perfect parking with Purple Parking. Get yourself to Purple Parking online, and look through Airport News, Parking Services, Travel Advice and Airport Parking options before you choose just how you’ll save with your Purple Parking discount code. When you’re ready to save with your Purple Parking voucher, choose which airport you’ll be traveling to, select when you’ll be departing and returning, and prepare your Purple Parking promo code. Provide your email address and personal details, and then update your vehicle details before confirming when you’ll be arriving to and departing from your car park of choice. Looking for a voucher code for Airparks? Visit couporando.co.uk. In category Travel you will find lots of coupons for online stores such as Park and Go Airport Parking, Thomas Cook. Begin by navigating to the Purple Parking online parking emporium, and sift through the news information and options from Parking Services to Travel Advice, Airport News to Airport Parking and think carefully about the very best way to save with your Purple Parking discount code. When you’re ready to take the plunge and redeem your savings with your Purple Parking voucher, select which airport you’ll be traveling to and from, choose when you’ll be departing and returning and get ready with your Purple Parking promo code. Review all of the parking options available from Purple Parking and keep a close eye on those transfer times and details. To reserve your parking, enter your email address and personal details, add the required information about your vehicle (including registration number) and confirm your arrival and departure dates and times. Don’t forgot to redeem your Purple Parking promo code before finalizing your payment! Don’t forget to check them often, as you can never be sure when a free Purple Parking Promo code might be waiting for you! 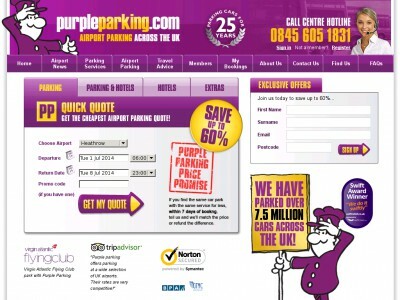 Buy now online at www.purpleparking.com. Purpleparking.com has provided a unique way to comfortably park your car at airports in the UK, and now thanks to a Purple Parking promo code or a Purple Parking voucher, the companies already low prices can be lowered even more. Airport parking has never been more convenient thanks to Purple Parking and their clever system, and a Purple Parking discount code is a great way to ensure you are getting the best possible price for their services. So before you start dreading that upcoming airport parking, grab your Purple Parking promo code and start taking advantage of their clever services!